Each component of the 2018 plan demonstrates Phipps’ continued green innovation and impact. 1. Facilities Renovation and Expansion – The new Exhibit Staging Center (ESC) will expand Phipps’ Living Campus, revitalizing a former public works building on a brownfield. Designed to be net-positive energy and net-zero water, the building will implement biophilic design concepts and is expected to achieve multiple green building certifications. Upon completion, the Living Campus will include new construction (CSL), modular (Nature Lab at Phipps) and renovated (ESC) green building designs. Green Buildings – "What Does Good Look Like? 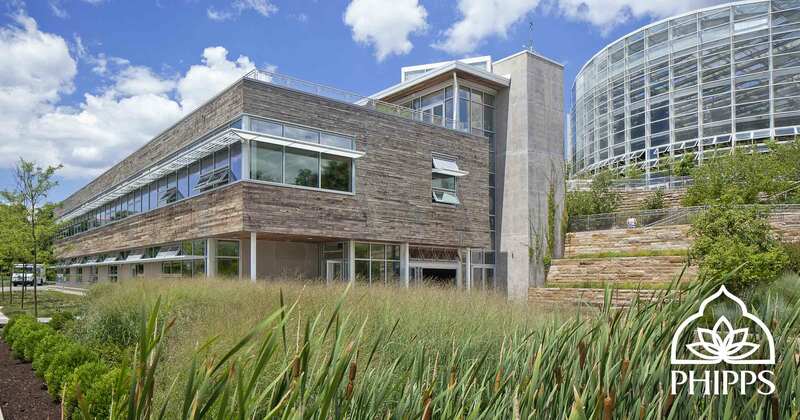 Getting the Green Building You Want" will be held on Wed., Feb. 21. Phipps’ Accredited Professionals will help organizational leaders get the green building that meets their values and aspirations, walking through rating systems related to green buildings, human health and landscapes and showing attendees how to use them, setting them up for success. Sustainable Landcare – Sustainable Landcare Accreditation Training will be held on Mon.–Thurs., Feb. 12–15. Modeled after the NOFA Organic Landcare Program, Phipps brings nationally renowned landcare standards training to Pittsburgh through this intensive workshop for landscape and lawncare professionals, distinguishing them as true sustainable practitioners. 3. Plastics Reduction – Phipps will review and minimize single use disposable plastic, reducing plastic materials used in the Conservatory. By 2050, it is projected that there will be more plastic in the ocean than fish if we do not join together in reducing plastic use. Phipps is committed to doing their part while teaching others about this important issue. 4. Expanded Biophilic Research Institute – Phipps’ Research Institute for Biophilia and Science Engagement is the first of its kind, taking an integrative, multi-disciplinary approach to understanding the impact of connections between people and their environment. Phipps will expand the Research Institute in 2018, adding multiple positions and increasing team members with Ph.Ds. to five scientists. 5. Studio Phipps: Sustainable Design Growth and Community Impact – Phipps’ sustainable landscape design group Studio Phipps inspires commercial clients to look at nature differently by considering ways to integrate the natural world into buildings and find feasible solutions to their design challenges. The group will continue to grow to help more organizations establish or expand green spaces, supporting the Mayor of Pittsburgh’s sustainability plan and Pittsburgh’s status as a Biophilic City. About Phipps: Founded in 1893, Phipps Conservatory and Botanical Gardens in Pittsburgh, Pa. is a green leader among public gardens with a mission to inspire and educate all with the beauty and importance of plants; to advance sustainability and promote human and environmental well-being through action and research; and to celebrate its historic glasshouse. Phipps commemorates its 125th anniversary in 2018, celebrating its historic past, vibrant present and exciting future ahead — including inspiring seasonal flower shows, community events, public programs and groundbreaking green innovation. Learn more at phipps.conservatory.org. Photo © Denmarsh Photography, Inc.